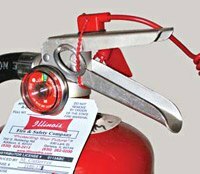 Fire Extinguishers are being stolen and vandalized with increasing frequency. In case of emergency...is your fire extinguisher where it is supposed to be? 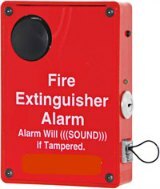 If the sensor is removed from the handle, or the extinguisher is removed from the wall, the alarm will sound. A beaded strap wraps around the entire handle, passing thorough a pin an sensor to help ensure that the alarm sounds if tampered with.